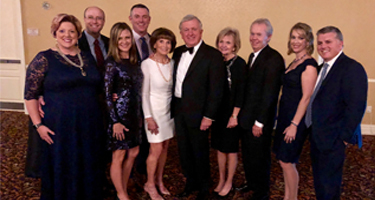 Last Friday, IPTA President Mike Riley, PT was honored during HSHS St. Elizabeth’s Foundation Gala as the recipient of the 2018 Elizabethan Award for his commitment to HSHS St. Elizabeth’s Hospital and the future of health care in his region. Aside from serving as our current IPTA President, Mike is well known in his community as a local business man, philanthropist and volunteer. Join us in congratulating Mike Riley, PT in receiving this honor. Pictured Mike Riley, PT with family.